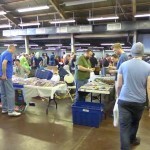 Before the convention was even halfway over attendees already anticipated returning next year to SUPER! 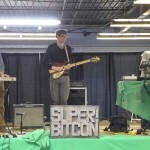 BitCon held in Oklahoma City, OK. 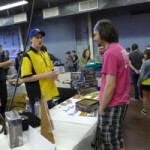 Organized by the Retro Gamers Society, SUPER! 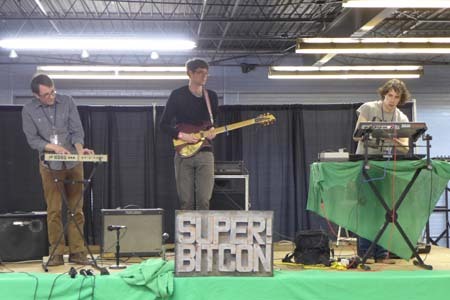 BitCon served as fundraiser, meetup, flea market, and festival to the gaming public. 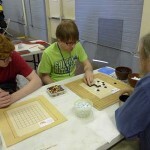 And though centered on classic gaming, and video gaming in particular, the event was no less welcoming to gaming of all varieties at the event. 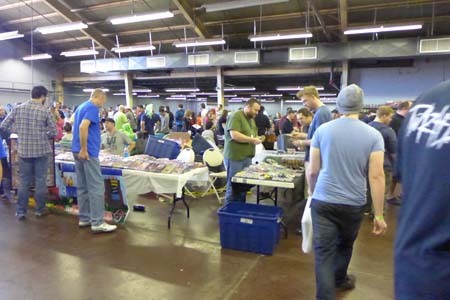 Held at the Oklahoma State Fair Park’s Hobbies, Arts and Crafts Building, nearly the entire floor space was populated by numerous vendors and exhibitors displaying a plethora of games, consoles, accessories, memorabilia, art, and crafts for browsing and purchase while attendees mingled, shared, and played throughout the day. 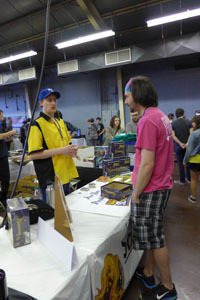 Along the outskirts of the central exhibit floor was a side stage where bands played throughout the morning and afternoon, a room hosting panels and presentations throughout the entire event, and another room serving as an arcade for attendees to play pinball, arcade games, or a few current generation fighting games all for free. 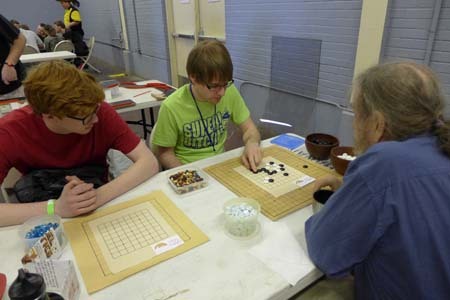 Yet not to be overshadowed in such a digital gaming environment was a curtained portion of the hall devoted to tabletop gaming inhabited by the local gaming shop Game HQ, Inc., the Oklahoma Go Players Association, and the Oklahoma Tabletop Gamers Society encouraging and helping attendees to play various tabletop games from their library as local tabletop gaming company Salamander Games introduced passersbys to their latest projects. With so much ongoing activity occurring one could easily lose track of time, perhaps missing out on a few panels such as the game development panel hosted by the team-up of James Simpson and Luke Simkins from Goldfire Studios with Matt Harmon of Bonzo Apps to share their experiences, advice, and speculations on game development and the gaming industry. 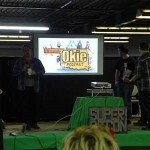 Yet the Retro Gamers Society has thankfully posted their recording of these panels on their Youtube page. And even as traffic wound down and exhibitors were slowly packing away their wares as the sun began to set, festivities continued into the night as further panels continued such as the Nintendo Okie podcast hosting a game centric quiz show, musical group Tip Top Secrets serenading the evening attendees, and both the free play arcade and tabletop gaming room still open for play before the bittersweet closing comments ending the convention. And whether an attendee remained til the end of the convention or left early, many of them had already decided to return next year. 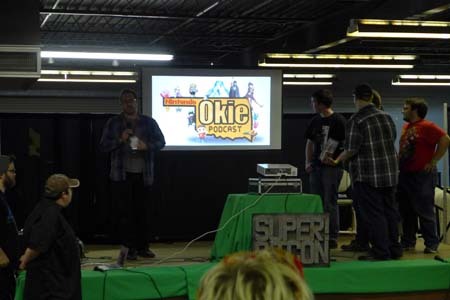 Until then, the staff of Oklahoma Game Development hopes to catch up with the RGS at a later date for a post con interview and plans they have for next year.